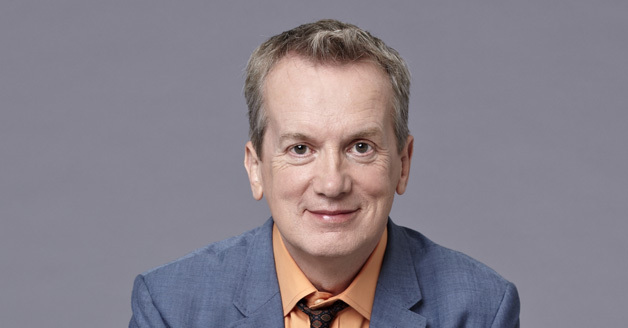 Frank Skinner is an award-winning stand-up comedian, writer and actor and currently hosts BBC1’s Room 101 and Sky Arts’ Portrait and Landscape Artists of the Year. He created the hit shows Fantasy Football and Baddiel Skinner Unplanned with his double act partner David Baddiel, along with the football anthem Three Lions which has charted at number one on three separate occasions. He has also created and hosted shows including The Frank Skinner Show (BBC/ITV), Frank Skinner’s Opinionated (BBC2) and Frank Skinner on Demand (BBC iPlayer), as well as authoring documentaries on subjects including Muhammad Ali, Elvis and George Formby. Frank’s live career began in 1987 at the Edinburgh Festival Fringe and four years later he won the Perrier Award (now Edinburgh Comedy Award), the most prestigious prize in comedy. He last toured the UK with his show Frank Skinner: Man in a Suit which included a sold-out return to the Fringe. He recently wrote first ever play, Nina’s Got News, as part of the Debut initiative, which is on at the Edinburgh Fringe this year. His weekly radio show on Absolute Radio has won three gold awards at the ARIAs, gets over a million listeners a week, and saw Frank inducted into the Radio Academy Hall of Fame. His other radio work includes critically-acclaimed comedy drama series Don’t Start alongside Katherine Parkinson and comedy panel show The Rest is History, both on Radio 4.